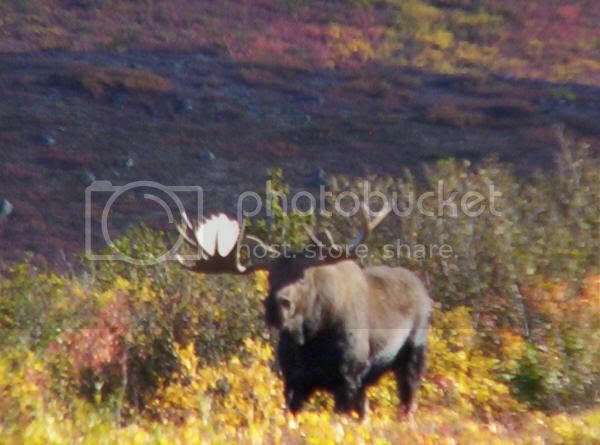 Curious what spread you think this moose is. 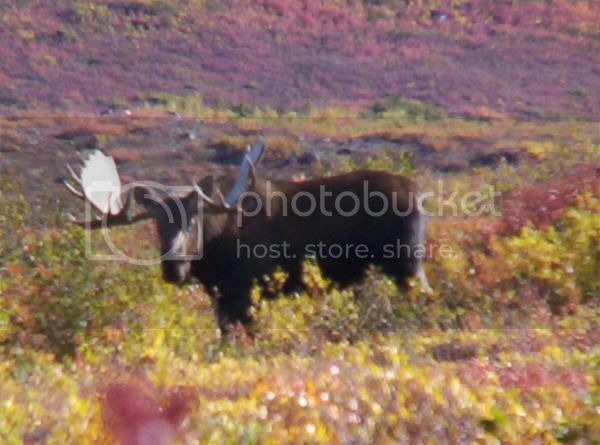 Thread: Curious what spread you think this moose is. On the first day of a ten day moose hunt on foot I passed up this bull. We stalked to 140 yards and watched him for about 10 minutes. He certainly was beautiful and had amazing brow tines, but we were 8 miles in. I had told myself I wouldn't shoot the first bull I saw on the first day just so we could get a better feel for what bulls were in the area. Our camp was 4.5 miles in on this day and a moose at that distance would have been easier than 8, especially with the temps as high as they were. We never saw him again, probably because of the horse camp we realized was in the area later, they'd already taken 3 bulls and a griz. I felt it was the biggest mistake I'd ever made, but my husband assured me it was the right decision. When the Lord gives you an opportunity like that with such a beautiful creature, seems like you should take it. Now a couple weeks later and two moose in the freezer ( and family and friends freezers ) I can look back with a more objective attitude, glad that I didn't shoot it. I know the meat would have spoiled for sure with the temps and the distance we would have ended up hiking. Three of us + 8 miles one way = still a lot of miles. We know he had four brows on the left side and 4 scoreable with two maybe's on the right, but we couldn't agree on spread. Any ideas? Two of these photos were taken through a pair of binoculars so they are a bit blurry. Hey you! How you guys holding up? Nice bull there...where's the pics of the hog you did shoot! I still want to hear that story. When do you leave for MT? Low 60's. Probaby 62. I passed on one slightly smaller on Sunday, that I thought was in the high 50's. Already had one in the 6 wheelers and have a November permit to use, so passed. Not the easiest to tell, but it is surely not over 65". He's a dandy Jill. I'd have to go with around 65". Still sending people to check out your web site. It's the best I've found that shows hunting and living in Alaska. You guys take some great pix. Rick (twodux) thanks for the nice comments on the website. I'm almost done updating the hunting page with this years hunt, so be sure and check it out then. I'm sure I'll post some other pics on here as well! Ryan (shoot2kill) sorry we haven't called you back yet. Just got back from cutting up the meat at a friend's house. I'm almost done with the story though. Talk to you soon. He's definately 60 +, that right brow is pretty impressive. You can tell from the photo that his right side is so heavy that the beam is drooping down coming off the skull, thats usually a darn good indicator that he's big! Wow on that moose and wow on letting it go by. 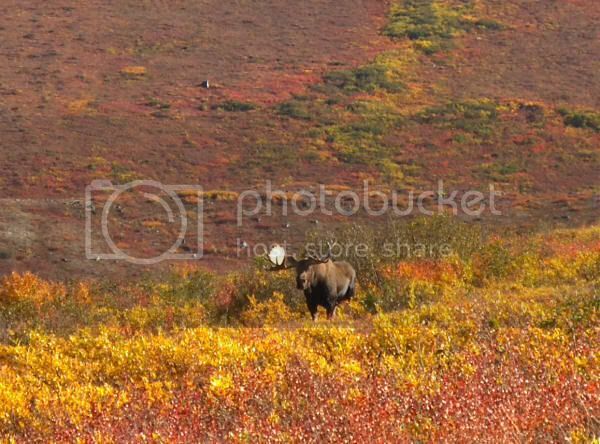 I shot a moose that was 53 inches last fall and it was not as big as that one, my vote is 60-65 inches. Tough call letting it go but if the meat would have spoiled let it go. Could you of called in a pilot and gotten out earlier? mid to high 50's maybe 56" to 58". I don't generally like to call a spread until I see a true frontal shot. Too many ways for things to go wrong. Still, this fellow looks close to the mid sixty range to me. Thin palms though, which sometimes means a bull not yet up to his full size. On the other hand, he has a short dewlap, which means his normally long, ropy dewlap they usually have was probably frozen off in a previous winter. In my experience mature bulls often lose that ropy dewlap and this is sometimes a further clue as to the size of the animal. Hopefully that makes sense? In summary, I'd say 65 or so, and still growing. Go back next season and look him up. He may stay that size though, with the general lack of heavy mass up top. Good call on passing him up because of meat care issues. Itchy trigger fingers often waste good meat by making poor judgments. Nice job. No one else has asked........so I might as well. Why were you hunting that far from the road( or whatever place you started)? With a 16 mile round trip for one load, your looking at alot of walking with heavy loads, even for 3 people. If it wasn't logical to kill something that far back, why be there in the first place? Were you looking for other species as well, like bear? I figured someone would be bound to ask us that question. We were looking for bears as well, but that really wasn't why we ended up 8 miles in. Topo maps are great and all but until you walk the country you have no idea what you're in for. When we started on our walk that day it was midmorning and by the time we got to our original destination it was maybe 1:00 and hot. Didn't figure much would be moving so we decided to peak over the next ridge to have a look at the country. When we first planned this hunt, we'd said 7 miles would be about as far as we'd pack a moose between the three of us. It just happened we went a little further after we saw that bull. Sure 7 miles is still a giant task with a moose, especially when you figure all the trips. We packed our other two moose out this year in two trips with heavy packs. You figure 100lbs a pack, with the boys carrying a bit more than that. That equals a moose boned out. We knew we couldn't carry that heavy of packs for 7 miles though, so we figured three round trips each. We don't have the luxury of pack animals, 4x4 vehicles, boats, or planes so our feet are all we have and we use them. Aaron and I packed our first moose out 4.5 miles alone a couple years back. It took us 3.5 days. We were blessed with very cold temps though; never getting higher than 25 degrees. In this situation, the distance with temps would have been a disaster for the meat. We just had no idea we'd be battling such warm temperatures. Jill... The world needs more wives like you. Congrats on the successfull hunt! Hey Borks, R Miller here. Nice moose , i'd have to say 55"-59". Sweet bull for sure. I tried to respond to emails the 12th, but I don't think they went through. Just got back in town myself and I will try the other email. Congrats are in order for sure. If you're comin' back into Anch. lets swap stories and have a beer. 60+ The droop of the beam guarantees it.